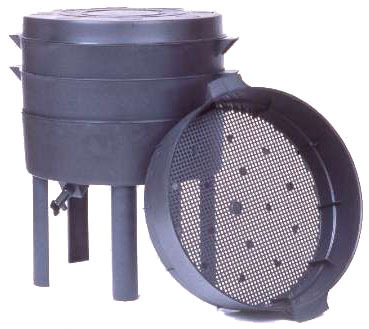 Create the finest fertilizer known and eliminate your food scraps going into the landfill. This upward mobility system is great for turning plate scrapings into worm castings. 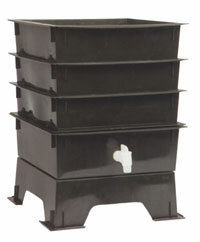 It is about 25% larger than the Worm Factory and is a great place to house your worms. This bin works on the principle of upward migration. After the first tray is fed until it is full, a second tray is placed on top. By the time the last tray is full, most of the worms will have left the original tray. The vermicompost in that tray is then dumped out, and the tray moved to the top of the stack. Each bin comes with coconut coir bedding, manufacturer's instructions, and some important instructions and tips from Gardengold. The Worm Factory 16 in X 16 in sq.